New Zealand is home to a range of religious groups, including Hindus, Buddhists, Muslims, Sikhs and Jews, as well as Christians. Since the late 20th century New Zealanders’ religious affiliations have become increasingly diverse, as a wider range of immigrants have settled in the country. Religious diversity means the existence of different religious groups within a society. New Zealand is home to Christians, Hindus, Buddhists, Muslims, Sikhs, Jews and other groups. Māori brought religious customs and practices from Polynesia, and European settlers brought Christian practices. Until the late 20th century most New Zealanders were Christians, but in 2013 42% of people said they had no religion. From the 1980s a more diverse range of immigrants settled in New Zealand. Many belonged to non-Christian religions. 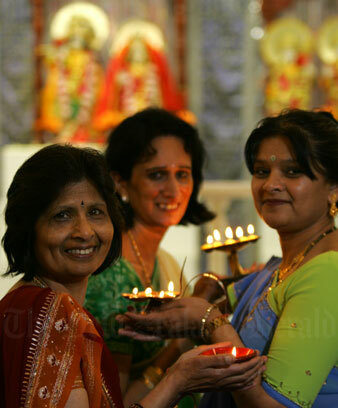 Hinduism is the second-largest religion in New Zealand, with about 89,900 followers in 2013. Hinduism covers a range of beliefs and practices originating in India, including Diwali, the festival of lights, and Holi, the spring harvest festival. Around 58,000 New Zealanders were Buddhists in 2013. They follow the teachings of the Buddha, doing meditation and other practices in order to end suffering. New Zealand’s first Buddhists were Chinese gold miners in Otago in the 1860s. From the 1980s Asian migrants brought their own forms of Buddhism, and some New Zealanders became Buddhists. In 2013 there were more than 45,000 Muslims, mostly immigrants. They believe in one god, Allah, whose teachings were given to the prophet Muhammad. Muslim communities are based around a mosque (temple). Some Muslims have faced prejudice and abuse. In 2019, 50 were killed in a terrorist attack in Christchurch. In 2013 New Zealand was home to more than 19,000 Sikhs, a religious group from the Punjab, India. Sikhs follow a lineage of 10 gurus (teachers). Sikh men traditionally wear a turban and a kara (iron bracelet), and have a beard. Jewish communities developed in the early years of European settlement. In 1901 there were about 1,600 Jews in New Zealand; in 2013 there were nearly 7,000. Jews believe that God revealed his commandments to the prophet Moses in the form of the Torah (Jewish holy book). Jews have sometimes been the target of abuse, for instance when Jewish graves were damaged at Makara, near Wellington, in 2004. Bahá'ís follow the teachings of 19th-century Persian prophet Bahá'ulláh, who believed in religious unity, and equality for men and women. In 2013 there were about 2,600 Bahá'í in New Zealand. Other movements include spiritualist churches, scientology, Rastafarianism, new age groups and witchcraft. Interfaith groups have been set up to bring different religious groups together. New Zealand law protects people’s right to practise their own religion.